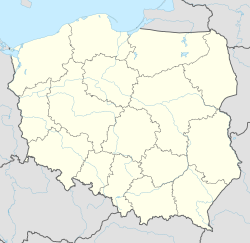 First mentioned in 1455 records, on 17 July 1736 Jedwabne received city rights from Poland's King August III, including the privilege of holding weekly Sunday markets and five country fairs a year. A wooden Catholic church with two steeples was built in 1737–1738, and a synagogue around 1770. The Jedwabne synagogue was a fine example of the unique Polish Jewish architectural tradition of wooden synagogues. At the end of the 18th century, new textile factories opened. In 1851 there were as many as 17 weaving establishments employing 36 workers in the town. In terms of its cloth production, Jedwabne was already the eleventh-largest manufacturing centre in the Kingdom of Poland. By 1862, 11 mechanical and 13 manual weaving machines had been installed at Jedwabne. The town's cloth production fell into decline only after the January Uprising of 1863, due to Russian repression against Polish and Jewish entrepreneurs. The town was the center of a large Jewish community with a population in 1900 of 1,941. Following the Soviet invasion of eastern Poland in World War II in fulfillment of the Molotov–Ribbentrop Pact, between 1939 and 1941 the Soviet NKVD conducted anti-Polish repression. It was preceded by a successful Soviet attack against a Polish partisan unit stationed in the Kobielne Wilderness. In 1940 the town had 3,985 residents: 3,670 Poles, 250 Jews, and 65 Belarusians. The NKVD arrested a number of Poles and their families and deported them to Siberia. The NKVD arrested and killed Parson Ryszard Marian Szumowski. In September 1939 following the Invasion of Poland, Jedwabne was briefly occupied by German troops who deported some 300 men to labor camps prior to transferring the area to the Soviets. On 23 June 1941, as part of Operation Barbarossa, German troops reoccupied Jedwabne. Jewish refugees from Wizna and Radziłów, where on 7 July Jews were burned alive by Poles in a bard, took refuge in Jedwabne. on 10 July 1941, a small German unit (two to eight men) arrived in Jedwabne and ordered the Jews of the town to assemble in the town square, however teh Germans played a passive role in the subsequent violence. A group of Polish men humiliated, raped, a killed some of the assembled Jews. Some 50 to 70 Jews were forced to tear down the statue of Lenin and place the pieces in a barn, after which they were beaten to death. The Polish men then marched the rest of the Jews into the barn, and set it alight. Casualty estimates vary; a controversial forensic investigation from 2002 set the number at 300 to 400 dead while other estimates range as high as 2000. Accounts differ as to the number of survivors of the massacre as well (from 125 to 302). Some 12 of the Polish perpetrators were convicted in 1949, receiving prison sentences of eight to fifteen years. Some of the surviving Jews were interned the Jedwabne ghetto following the massacre, however one to three months later the ghetto was dissolved and the inmates expelled to the Łomża Ghetto. From there on 2 November 1942 they were transferred to the Zambrów transit camp, and from there in January 1943 to the Auschwitz extermination camp. Some Jedwabne Jews managed to flee the ghetto liquidations, and some of them survived the war. In the early 20th century many Jedwabne residents had emigrated to the United States. Landing and settling in New York City, they built the synagogue Congregation Anshe Yedwabne at 242 Henry Street in the Lower East Side. Jedwabne is the administrative and economic centre for the surrounding gmina, which has an agricultural character. It offers educational and healthcare services for the community, as well as administrative support, business infrastructure, and investment financing. The town is flanked by the Biebrza National Park, the biggest complex of natural marshes in Central Europe; it is inhabited by moose as well as other animals and bird species, attracting numerous tourists. The Biebrza river nearby is surrounded by campgrounds for fishing, hiking, and mountain biking. Agrotourism substantially contributes to the local economy, with prolonged tourist season beginning on March 1 and lasting until October 30 each year. ^ Maria and Kazimierz Piechotka, Heaven's Gate: Wooden Synagogues in the Territory of the Former Plish-Lithuanian Commonwealth, Institute of Art, Polish Academy of Sciences, Wydawnnictwo Krupski I S-ka, Warsaw, 2004, pp. 231-32. ^ (in Polish) D. Boćkowski. Na zawsze razem. Białostocczyzna i Łomżyńskie w polityce radzieckiej w czasie II wojny światowej (IX 1939 – VIII 1944). Neriton, Instytut Historii PAN. 2005. p. 120. ^ a b c The United States Holocaust Memorial Museum Encyclopedia of Camps and Ghettos, 1933–1945, Geoffrey P. Megargee, Martin C. Dean, and Mel Hecker, Volume II, part A, pp. 899-902. ^ "Gmina Jedwabne". Urząd Miejski w Jedwabnem. 2008. Retrieved September 17, 2012. ^ "Walory turystyczne". Urząd Miejski w Jedwabnem. 2008. Retrieved September 17, 2012. W czterdziestym nas matko na Sybir zesłali" - Polska a Rosja 1939-42, Wybór i opracowanie: Jan Tomasz Gross, Irena Grudzińska-Gross. Wstęp napisał Jan Tomasz Gross. Wybór dziecinnych wypracowań polskich dzieci uwolnionych z sowieckiej zsyłki lat 1939-1942 ze zbiorów Instytutu Hoovera. Londyn: Aneks 1983.